Yuva (Yash), a college student, has had a penchant for violence since childhood. His mother Durga (Suhasini Manirathnam) tries to counsel him but fails. However, we are told that she has brought him up narrating stories of Veer Savarkar, Subhash Chandra Bose and Bhagat Singh, hoping that her son will grow up to be patriotic and do good for the country. But Yuva grows up to be a local goon. He meets Nisha (Shanvi Srivastava) and falls in love with her. Yuva and Nisha run into Boss (Ravi Shankar), a druglord. 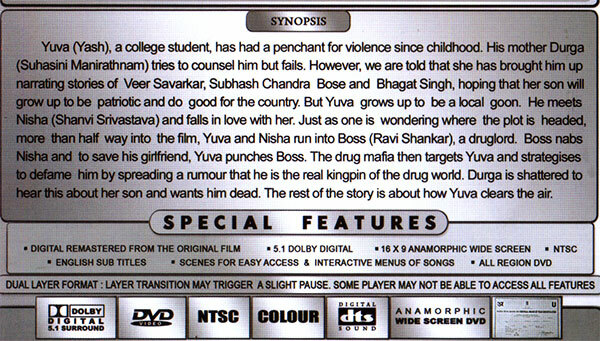 Boss nabs Nisha and to save his girlfriend, Yuva punches Boss. The drug mafia then targets Yuva and strategises to defame him by spreading a rumour that he is the real kingpin of the drug world. Durga is shattered to hear this about her son and wants him dead. The rest of the story is about how Yuva clears the air.